For over five decades Mars Catalyst has developed effective and innovative ways of working with the academic world; combining the best of business and academia to crack complex problems. From the outset, the Economics of Mutuality has been built upon multi-year relationships with leading academics and academic institutions around the world. In 2014, a substantial strategic partnership with Oxford University’s Saïd Business School was established to focus on the development of a business management theory for the Economics of Mutuality with corresponding teaching curriculum, new management practices and case study research. 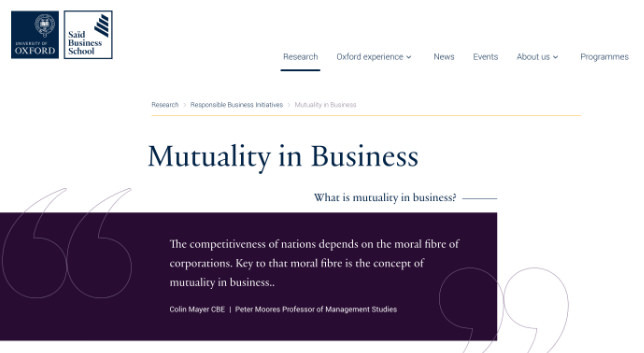 The research programme, called Mutuality in Business, has combined the pursuit of normative questions — 'What is mutuality and how should it be enacted?' — with grounded, ethnographic research on current thinking and practices. This has led to the development of field experiments and case studies examining how large corporate actors conceive of and pursue responsible business practices and how these relate to their financial, social and environmental performance. The multi-year partnership with Oxford University is governed by a group of senior Mars executives and the leaders of Saïd Business School. Since 2015, Mars Catalyst has been working closely with ESSEC Business School, establishing the Chair of Networked Business Models and a small research team. The partnership focusses on challenging the assumptions of linear value chain thinking in business by researching the theory and practice of business ecosystems. Historically, the effective management of the value chain determined the potential revenues and performance of the firm. It regulated and shaped the activities of the organisation. Yet, recent shifts in business and the economy (e.g. product-to-service value proposition, digital transformation, big data, knowledge economy, business ecosystem) have forced us to question a number of traditional business model assumptions. It is increasingly clear that firms who limit themselves to thinking in a linear way miss out on growth opportunities and perfrom sub-optimally. Business is set in increasingly complex, volatile, and fast-changing contexts that current linear value chain thinking typically overlooks or mismanages. What are the next breakthrough business solutions for a post-Friedman world where a firm’s bottom line is not the only indicator of success? We're a global team and we'd love to connect with you, wherever you are based.